Use the Set Variable Value operation to assign values to variables in your scenario or project. Parent operations: Any other operation. If the scenario editor displays pages and connections, the operations cannot be placed between a page and a connection. Child operations: The operation cannot have child operations. The Think Time edit box at the top of the editor specifies the number of milliseconds the operation will wait before it starts executing. The name of the variable to assign the value to, preceded by the @ character: @VariableName. You can specify a variable defined in the current scenario, or a project variable defined in the Variables collection of your project. If the specified variable does not exist, it will be added to the current scenario. To select an existing variable from the list, click in the Variable or Value column. The value to be assigned to the variable, or an expression or variable whose value will be assigned to the variable. Note: Do not enclose string values into quotes. 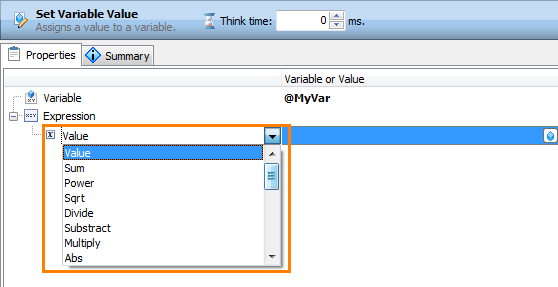 To copy the value of another variable, specify the name of the source variable preceded by @: @VariableName. Specify parameters of the function. 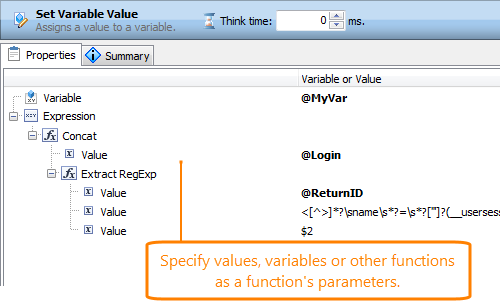 Parameters can be hard-coded values, variables (@VariableName) or other functions. To use a function result as a parameter, change a parameter’s Value to a function name. Note: If the specified expression cannot be calculated (for example, the parameters are invalid), the variable value will not be changed. Sums two or more numbers. Number - Specifies a number whose exponentiation you want to get. Power - Specifies an exponent. Returns a square root of a specified number. Dividend - Specifies a numerator. Divisor - Specifies a denominator. Returns a difference of two numbers. Returns a product of two numbers. Returns an absolute value of the specified number. Substring Returns a fragment of a string, starting from the specified position and having the specified length. String - Specifies a string from which a fragment will be retrieved. Start position - A zero-based position of a character where the needed fragment starts. Substring length - The number of characters in the fragment. Find Finds the first occurrence of a text fragment in the specified string and returns the zero-based position of the first matching substring. If the function fails to find the sought-for fragment, it will return -1. String to search in - Specifies a string where the function will search for the fragment. Substring to find - Specifies the fragment to search for. Offset - Specifies the initial position of the search. By default, the search starts from the beginning of the initial string (Offset = 0). Extract RegExp Returns a string fragment that matches the regular expression. Source string - Specifies a string in which the function will search for the fragment. Regular expression - Specifies a regular expression, matches to which the function will search for. For information on the regular expression syntax, see Regular Expressions Syntax. Match group to extract - Specifies a subexpression (group) in a regular expression a match to which the function will extract, in the $number format, where number is a subexpression position in the regular expression. You can specify a combination of several subexpressions or combine them with text. For example, $1$2 or $1-$2. Replace Replaces a fragment in an initial string with the specified substring and returns the resulting string. Source string - Specifies a string to be processed. Substring to replace - Specifies a substring whose occurrences will be replaced. Replacement string - Specifies a string that will be substituted into the initial string. Replace all - A boolean value that specifies whether the function will replace all occurrences of the specified fragment or only the first occurrence. Ignore case - A boolean value that specifies whether the search should be case-sensitive or not. \x decode (2 hex digits) Replaces symbols specified in a hexadecimal format with appropriate characters. The function expects the 2 hexadecimal digits after the \x prefix. \x decode (4 hex digits) Replaces symbols specified in a hexadecimal format with appropriate characters. The function expects 4 hexadecimal digits after the \x prefix. Note: In order for the hexadecimal encoding and decoding functions to work correctly, the appropriate system code page must be installed on the computer where the scenario is simulated. You can learn about code pages in the MSDN Library. This page provides summary information on the operation like the number of found errors, the list of variables used, and so on. Information on the page is read-only. You can find information on issues in operation properties in the Summary page. Also, information about the erroneous settings is displayed in the editor’s header area.